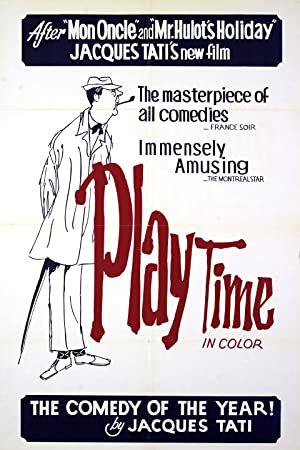 This week, we tackle Jaques Tati’s comedy Playtime. In a unique twist, neither Tim nor Jena had seen the film. It is also our first “foreign language” film although the fact the movie is French is hardly relevant as the dialogue is almost completely unnecessary. If you’ve never seen the movie and you have Hulu Plus, that would be a great way to check it out. 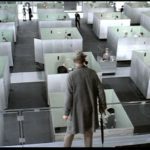 Even if you haven’t seen the film, you should totally listen to the episode as Playtime may be the most spoiler proof movie ever created. Our next episode will be recorded live at the Parkway Theatre on Sunday, November 17th. We’ll be watching John Carpenter’s The Thing with special guest host Matt Allex from Horror Show Hotdog! Plot: Monsieur Hulot curiously wanders around a high-tech Paris, paralleling a trip with a group of American tourists. Meanwhile, a nightclub/restaurant prepares its opening night, but it's still under construction.